In a comment, Kiki, a regular reader of Urbanfeed, gave a ringing endorsement of the black bean soup recipe from Cook’s Illustrated. It’s from the January 2005 issue, and for three years, I’ve contemplated trying it. 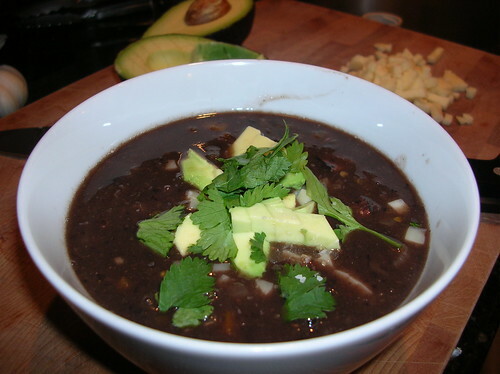 I love black bean soup, and I don’t have a good recipe for making it at home. But something was standing in my way: black ham. Cook’s has you simmer the beans with 4 oz of ham steak, to give the beans and broth a nice porky flavor. This makes sense. For most of us, a ham steak is easier to find than a ham hock, and then you have some nice bits of salty meat floating around in your soup. The thing is, the beans turn the exterior of the ham black. It just looks weird. But Kiki is a trustworthy source, and things have been a little crazy around the Urbanfeed homestead. I needed a batch of soup I could just re-heat throughout the week for a quick lunch or dinner. 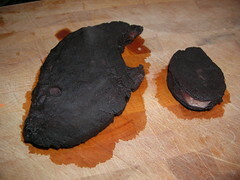 So I set my fear of black ham aside, and tried it two weekends ago. Not surprisingly, Kiki was totally right. The soup is delicious. It has a great texture — a little thick (but not muddy) with some whole beans still floating around. I know it looks like a lot of cumin, but it’s really perfect. And, of course, the best part of black bean soup is the accoutrements — a little chopped cilantro, diced avocado, sliced scallions, sour cream and, clearly, cheese. I like Monterey Jack diced up super tiny. The little cheese cubes sink into the soup and get all melty. It’s great. Don’t be afraid of black ham — it’s delicious. Seriously, I ate this soup almost every day for a week, and was only sorry when it was all gone. Place the beans, ham, bay leaves, water and baking soda in a large pot with a lid. Bring to a boil over medium-high heat; using a large spoon, skim scum as it rises to the surface. Stir in salt, reduce heat to low, cover, and simmer briskly until the beans are tender, 1 ¼ — 1 ½ hours. (It may be necessary to add about 1 cup additional water if the beans begin to dry out before they get tender.) Discard bay leaves. 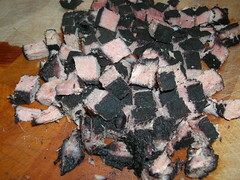 Remove ham steak, cut into ¼” dice and set aside. DO NOT DRAIN BEANS. Heat olive oil in an 8 quart Dutch oven over medium-high heat until shimmering. Add onions, carrot, celery and salt and cook, stirring occasionally, until vegetables are soft and beginning to brown, about 12 – 15 minutes. Reduce heat to medium, add garlic, red pepper flakes and cumin. Cook, stirring constantly, about 3 minutes. Stir in the beans, bean cooking liquid and chicken broth. Increase heat to medium-high and bring to a boil. Reduce heat to low and simmer, uncovered, stirring occasionally, for about 30 minutes. Ladle 1 ½ cups beans and 2 cups liquid into a food processor or blender and process until smooth. Return mixture to pot. (You can also ladle the mixture into a 4 cup Pyrex measuring cup and puree with an immersion blender.) In a small bowl, combine cornstarch and water. Gradually stir about half this mixture into the soup and bring the soup to a boil over medium-high heat, stirring, to thicken. If the soup is still thinner than desired, add the remaining cornstarch mixture and return the soup to the boil to thicken. Off heat, stir lime juice into the soup and serve with garnishes of your choice – lime wedges, minced cilantro leaves, finely diced red onion, sliced scallions, diced avocado, sour cream, finely diced or shredded Monterey jack cheese. This entry was posted in beans, pork, soup, Uncategorized. Bookmark the permalink. I’m glad you liked it. And you are totally right, the add-ins are the best part because you get to pimp your soup. We usually have it with the no-knead bread you wrote about a couple of weeks ago. I notice a heavy emphasis on pig in your recipes. How about something for us non-pig eaters…. It’s true, Les; it has been a bit of a pork-a-palooza around here lately. Mostly that’s because my last meat share was all pig (ham, ham steak, two kinds of chops and some bacon). But, I’m trying out a new (to me) method of roasting chicken breast Sunday night, and if it comes out well, I will post about it. That said, I wonder if you could make the black bean soup without the ham. I’m sure it would taste different, but it might still be tasty.